Confirming the attack, the Chairman of Madagali Local Government Council, Yusuf Muhammed, told the News Agency of Nigeria (NAN) that the attack lasted from 11 p.m. on Wednesday to 3 a.m. on Thursday. "They looted foodstuff, killed livestock and burnt the village completely," he stated. Mr. Muhammed said that the exact number of dead and injured people had yet to be ascertained and that villagers who escaped the attack were currently taking refuge at Gulak, the headquarters of the council. But the Spokesman of the Police Command in Adamawa, Othman Abubakar, who also confirmed the attack, said no life was lost. He said, however, that houses were destroyed in the attack-the latest in a string of deadly blows on mainly soft targets in Nigeria's troubled northeast. 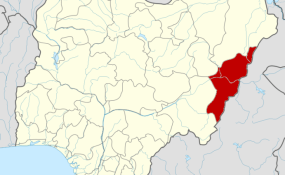 Speaking on the development, the Executive Chairman of the Adamawa State Emergency Management Agency, Haruna Furo, said only one person was killed and that many houses were destroyed.